This past weekend, Ariel and I had our first date (okay, first dinner together) in a long time (I have been traveling, he has been working crazy hours). 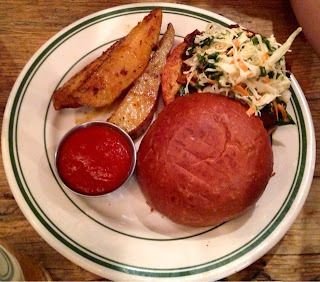 We decided to check out The Butcher's Daughter for dinner in Nolita. The Butcher's Daughter is a cute little eatery on the corner of Kenmare and Elizabeth. There are tables outside, as well as a family-style table and counter seats inside. It was raining out, so we opted to sit at the big table inside. The menu is mostly vegan, with just a few dishes that include eggs. 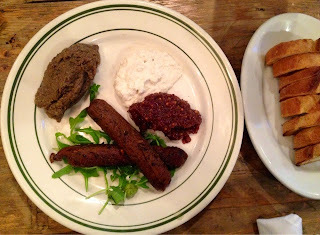 We decided to start with the charcuterie plate which included the following served with crostini: mushroom walnut pate, white bean and fennel sausage, and cashew ricotta with fig mostarda. Ariel loved the pate, while my favorite was the sausage which reminded me so much of pepperoni. 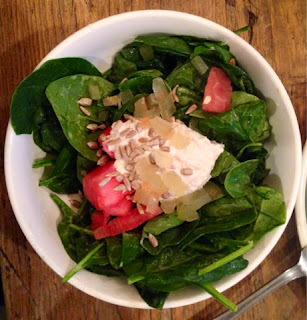 For our entrees, I got watermelon ricotta salad - more of the cashew ricotta and juicy watermelon served over a bed of baby spinach. It was decent sized and very tasty. Ariel got the Pulled Pork BBQ sandwich - shredded, BBQ sauce soaked portobello mushrooms served on a brioche bun with potato wedges and cole slaw. While mushrooms stand in for meat on so many dishes, I had never seen shredded mushrooms as "pulled" meat, and I thought this was super creative. I definitely plan on trying to recreate this at home. We didn't get dessert because all they had left were muffins. I suppose will just have to go back again when they are well stocked with vegan ice cream and chocolate mousse. My only complaint with the meal was that the potato wedges were really greasy. I was really craving potatoes and was super dissapointed how they came out (good thing we didn't really like them because there were only like 4 in total!). 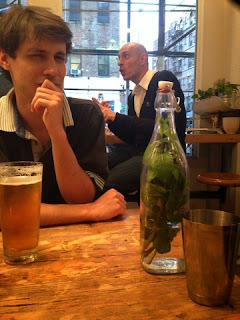 I will also say that, like many organic/sustainable/vegan places, the meal was not cheap. It was not crazy expensive, and I'm willing to pay for the quality of food, but just wanted to throw that out there. Overall, I really enjoyed the creativity of the menu as well as the atmosphere so I'm sure I will be back for lunch or dinner again.